Family...no....puppy who likes to chew....yes...cats that like to knead their claws....yes :) but I guess they are family too right? Cats and dogs can count as family. Definitely dogs, anyway-Ha! I feel your pain. I've gotten rid of things rather than see them be destroyed by those I love too! Exactly! When you know the thing is destined to be broken by a family member, why not set it before it happens?!! Thanks for the back-up! ...Dude! Hmm... I seem to remember a recent post about Mrs. Dude not wanting to sell a certain Coach purse and you giving her a hard time about it ;) Teasing aside, you obviously made a wise decision to sell. It's a beautiful cooler, and you made a great profit. Ha! Thanks, as much as I liked the color, now that summer is over, it just would have sat around the house waiting to get damaged by someone or some thing. So as they say - all's well that ends well! I found this retro 1950's silver cooler called a Thermaster. It's sweet!. I have been using it for my groceries, but will eventually sell it. It will be perfect for a mancave! Feetinwater-Nice score and you'll get some use out of it! Old coolers seem to do well no matter what. In addition to my Coleman cooler, I also flipped an old 7 UP cooler this summer too. I have not found any of these cool coolers yet but I will be keeping my eye out. Great decision selling the each separately and the cooler on craigslist. You have to be smart in this business. Great read. Thanks Adley. As a general rule, I like eBay because I can make more $$$ on an item. But since the postal rates really get expensive when you're talking BIG items, I usually sell bulky items on Craigslist and hope for the best. With the cooler it worked out pretty well. And yeah, the Coleman coolers are pretty great....hope you find one in your travels! I will and have...great blog! Also-Let me know how you do with Skimlinks, I've been thinking about using them...Dude! That is a bummer...I've been there! But you never know, maybe it's still there! Hope you find it...good luck......Dude! Too big to ship?? Parcel select would do just fine...I hate to say it, the baby blue in that condition would have gotten you $150+ on ebay - check out some completed auctions! 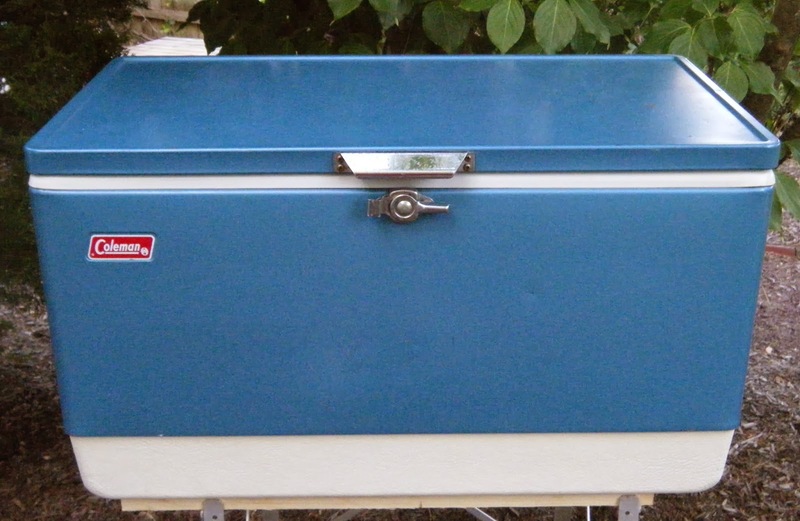 Generally, vintage Coleman coolers sell on eBay in the range of $60 to $100. And you are right, once in a while one hits $150 or more. Recently two identical baby blues sold on eBay-one for $80, while the other sold for $175. It's all about who's bidding on-line that week. But when you sell it on eBay, you have to back out both your eBay and Pay Pal fees, cutting into your profit. You can go parcel select, if you have the scale and labels, but it's not not much cheaper then standard parcel post. Then since your playing in Ebay's sandbox, you run the risk of an unsatisfied buyer who whacks your seller rating. Too much risk for too little profit on something I know I can easily sell on CL, where it's all pure profit and no risk. I'd rather get fat! Thanks for writing in...Dude!